배운자로서 그 어느곳보다도 배움이 절실한 농촌을 외면할 수 없었던 최용신, 가난과 무지 속에 갇힌 농촌을 계몽하는 것이 완전한 사회로 가는 기본임을 알리며 짧은 생을 불살랐던 그녀의 결의가 돋보이는 글귀이다. 농촌 계몽가 최용신, 우리에겐 소설 상록수의 여자주인공으로 잘 알려진 그녀는 1909년 일찍이 서양문물과 기독교가 유입된 개항장 함경북도 덕원에서 태어났다. 그녀의 조부는 학교를 세우고 교육을 통해 구국의 길을 찾으려 노력한 교육 운동가였으며 아버지도 교육에 종사하였다. 교육자 집안에서 태어난 최용신은 어릴 때부터 주일학교에 다니며 기독교 신앙 속에서 성장하였다. 1918년 고향의 사립학교에서 원산의 루씨여자 보통학교로 전학한 그녀는 농촌계몽 운동에 일생을 바치겠다고 다짐하게 된다. 1928년 루씨여자고등보통학교를 최우등으로 졸업한 그녀는 협성여자신학교에 입학하여 애국부인회 사건으로 옥고를 치른 독립운동가 황애덕 교수를 만나게 되면서 일생의 전환점을 맞게 된다. 미국 컬럼비아대학에서 석사학위를 받은 후 펜실베니아주립대학에서 농촌사업과 관련된 공부를 한 황애덕 교수는 협성여자신학교에서 ‘농촌사업지도교육과’ 과목을 가르치고 있었다. 한국 농촌의 실상을 강의하며 학생들에게 농촌으로 돌아갈 것을 강조한 황 교수의 가르침을 받은 최용신은 여름 방학에 농촌 현장 실습을 지원하였다. “제까짓 여자가 우리를 가르치러 왔느냐”며 그녀를 무시하고 마음의 문을 열지 않는 현실 속에서도 농촌을 향한 신념은 더욱 확고해졌다. 신학 수업을 중단한 최용신은 YWCA의 지원을 받아 1931년 10월, 경기도 화성군 반월면 샘골로 마침내 농촌운동의 첫걸음을 내딛게 된다. 샘골에 도착한 순간 그녀는 ‘나의 몸과 마음을 남김없이 태워 이 마을을 밝히도록 해 주소서’라고 기도하였다. 처음에는 교회 부속의 야학에서 어린이들을 가르치기 시작했는데 그녀의 헌신과 노력으로 이듬해에는 정식으로 강습소 인가를 받을 수 있었다. 학생 수도 점점 늘어 오전반, 오후반으로 나누어 운영되었고 밤에는 부녀자들을 모아 한글과 산수, 그리고 재봉과 수예를 가르쳤다. 강습소 신축에 대한 그녀의 설득에 주민들은 자발적으로 건축발기회를 조직하였고 마을의 유지가 기증한 뒷동산 솔밭이 터가 되어 1933년 1월 천곡학원이 완공되었다. 샘골은 나날이 활기찬 분위기 속에서 변화해 갔다. 생활 개선, 농가 부업 장려를 위한 부녀회가 조직되었고 공동생산을 늘려가며 공동체적인 경제 토대를 구축하기에 이른다. 샘골에서의 농촌 계몽 운동이 성공적으로 정착될수록 최용신은 새로운 지식과 구상이 더욱 절실해졌다. 샘골을 농촌 운동의 한 도화선으로 만들겠다는 신념을 가지고 유학을 결심한 그녀는 1934년 3월 일본 고베여자신학교 사회사업과에 입학하였다. 일본 유학 중인 약혼자 김학준을 만나 약혼한 지 10년이 되는 1935년 4월부터 민족을 위하여 같이 계몽 운동을 약속하기도 하였다. 약혼자 김학준과 최용신은 교회를 중심으로 사회 활동을 하면서 결혼을 약속한 사이이다. 그녀의 농촌 활동에 대한 열정으로 결혼이 늦어졌지만 둘은 신뢰와 사랑으로 결속되어 있었다. 미래에 대한 부푼 꿈을 안고 시작된 유학 생활이었지만 갑작스레 각기병에 걸려 그녀의 유학 생활은 6개월 만에 중단되었다. “누워만 있어도 곁에 있어 달라” 는 샘골 주민들의 간청으로 최용신은 샘골로 돌아왔다. 그러나 몸을 어느 정도 추스려 그녀가 다시 일을 시작하려는 시점에 YWCA로부터 지원이 끊기게 되는 상황을 맞이하게 된다. “도시의 여러분이여! 당신들의 생활은 얼마나 행복스럽고 얼마나 안락 하십니까? 우리 농촌의 아이들은 자라기에 배가 고프고 배움에 목이 마릅니다. 곡식을 심으면 일 년의 계가 되고 사람을 심으면 100년의 계가 된다고 하였거든 이 강산을 개척하고 이 겨레를 발전시킬 농촌의 어린이들을 길러주소서” 도움을 요청하며 그녀가 한 잡지에 기고한 글이다. 하지만 반응은 냉담했다. 악조건 속에서도 굴하지 않고 마지막까지 불꽃을 태우던 그녀는 결국 누적된 과로로 쓰러져 1935년 1월 23일, 27세의 꽃다운 나이에 생을 마감한다. 그녀의 유언대로 천곡학원이 바라다보이는 언덕에 영원히 잠들었다. 암울한 일제 강점기 시대에 농촌 계몽을 위해 청춘을 바친 최용신, 모두가 외면한 가난하고 무지한 농촌을 향한 그녀의 헌신은 그리스도의 사랑이다. The above statement depicts Yong-shin Choi’s determination very well. She was an educated woman who could not turn away from the farming villages. She believed enlightening rural areas from poverty and ignorance was the basic step toward a wholesome society. Yong-Shin Choi, a torchbearer for farmers, was born in 1909 at Dukwon, North Hamkyung Province, where the western culture and Christianity were introduced early on. To many of us, she is also known as the heroine of the Korean classic, Evergreens, written by Hoon Shim. Her grandfather was an educator who built schools and was involved in the Korean independence movement. Her father was also an educator. Born into the educator’s family, she attended Sunday school and grew up as Christian from early childhood. In 1918, she transferred from a private school in her hometown to Lucy Women’s High school in Wonsan, and promised to devote her life to the rural enlightenment movement. 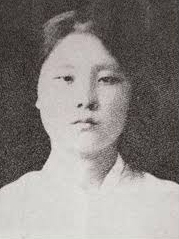 She graduated from Lucy Women’s High School with the highest grade in 1928, and reached the turning point in her life when she met professor Hwang Ae-deok at Methodist Theological Seminary. 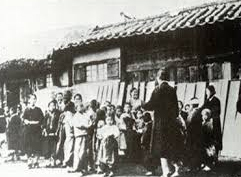 Professor Hwang, who endured imprisonment due to the incident of the Patriotic Women’s Society, was teaching ‘education of rural projects’ at the Seminary after receiving his master’s degree in the same subject from Columbia University and Pennsylvania State University. He lectured on the reality of rural life in Korea and stressed the importance of returning to rural areas to his students. Yong-shin took his advice and volunteered to work in a rural area during summer vacation. Even though people showed the attitude that ‘a girl like her could not educate them’ or ignored her genuine intention, her faith in rural areas didn’t waver. 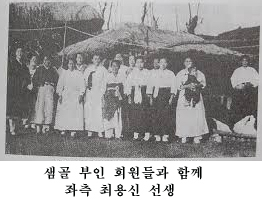 She discontinued her education at the Seminary and, finally, took the first step in the rural enlightenment movement at the Saemgol of Banwolmeon, Hwaseonggoon, Gyeonggi Province in October, 1931 with the support of YWCA. As soon as she arrived at the Saemgol, she prayed, "let me sacrifice my body and my heart, and let me be the light for this village." At first, she started to teach children at the night school affiliated with the church, but with her dedication and hard work she was able to get formal accreditation in the following year. As the number of students increased gradually, the classes were given in the morning and afternoon, and evening classes to teach Hangul, arithmetic, and sewing and handicrafts for women started soon. She persuaded the village people to build a new school building. They voluntarily organized a construction committee. A villager donated a pine tree field where Chungok Academy was completed in January, 1933. Saemgol was transforming day by day in a lively atmosphere. The women’s association was organized for improvement of life, promotion of farm households, and the joint production was increased to build a cooperative economic base. As the rural enlightenment movement at Saemgol became successful, Yong-shin Choi became more passionate for new knowledge and ideas. In March 1934, she decided to study abroad with a hope that she would become a fuse of the rural movement, and she enrolled at the Social Work Department of Kobe Women's Seminary in Japan. There, she met her fiancé, Hak-joon Kim, who was studying in Japan also. The two decided to work for enlightenment movement for Korean people together in April, 1935 which marked the 10th anniversary of their engagement. They made their commitment for marriage while doing social projects at the church ten years ago. Her passion for rural enlightenment slowed their marriage, but they were bound by trust and love. Although Yong-Shin Choi started studying abroad with a big expectation, her life in Japan was abruptly interrupted in six months due to Beriberi. However, the village people pled for her return, saying, “you are welcome here, even when you are bedridden.” So, she returned to rural province. However, the support from YWCA was cut off when she wanted to start working again after recovery. “Everyone in the city! How content and comfortable are you in your city life? Our children in rural areas are hungry. They are thirsty for learning. There is a saying that if you plant a grain, it will take a year to grow and if you plant a person, it will take a century to see the result. May I ask you to invest in rural children for the future of our nation and our people.” This was a part of an article she wrote in a magazine to seek help. Unfortunately, the response was apathy. Despite the adversity, she worked tirelessly until she unfortunately succumbed herself to overexertion and passed away on January 23, 1935 at a young age of 27. Just like her last wish, she fell asleep forever on the hill that overlooked the school. She devoted her youth to enlighten rural people during the Japanese colonial rule and exemplified love of Christ for the poor and benighted people of rural villages.